Kyouya is one of my favorite characters..
Actually, I took the chara in this screenshot, and made little different from the original. Browse Ouran High School Host Club Gallery: Recent | Popular. I think your vector is quite good but there's spaces for improvement. For example, when you vector the lighter part of Kyou-kun's hair, you can reduce its opacity to make it look more shiny. Same goes with the lighter part of Kyou-kun's face. Your vector line is smooth, no jagged parts which is really good as this is your second vectored wallie. The line of his nose is a bit off. And maybe you might want to remove the flowers on the left side of the wallie. uber-kawaii! kyoya-kun looks so cool and the flowers are a nice touch! awiie! 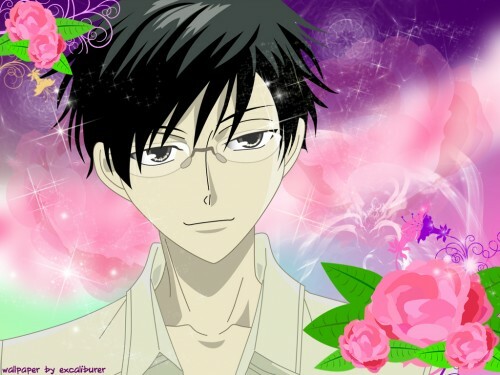 I love it... Kyoya<3 Good job. yaaaaaaay its kyouya! "doki" "doki"
It's such a beautiful one! Quote by AllBlacksSexy devil! Thx!